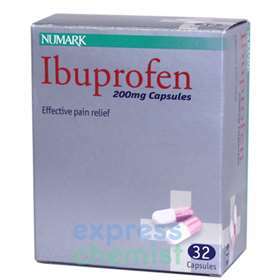 Numark Ibuprofen 200mg Capsules - Effective pain relief. For the relief of migraine, headache, rheumatic and muscular pain, pain of non-serious arthritic conditions, backache, neuralgia, toothache, period pain, feverishness and the symptoms of cold and flu. For oral use. Adults, the elderly and children over 12 years - 1 or 2 capsules to be taken up to 3 times a day. Do not give to children under 12 years except on the advice of a doctor. IBUPROFEN, MAIZE STARCH, METHYLCELLULOSE, MAGNESIUM STEARATE, GELATIN, TITANIUM DIOXIDE, ERYTHROSINE AND COLOUR.